Green Bay Packers quarterback Brett Favre says he&apos;ll return for the 2007 season. Favre announced his decision in a exclusive interview with the Sun Herald in Biloxi, Mississippi. Favre said he&apos;s excited to come back with a good nucleus of young players both on offense and defense. 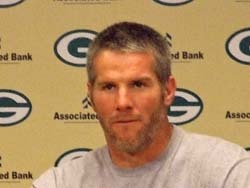 Favre also told the Packers the news this morning and made the decision after consulting with his family at home in Hattiesburg and that he knew he wanted to come back in the lockerroom after the season finale against the Chicago Bears. Favre completed 56% of his passes in 2006, throwing for 18 touchdowns and 18 interceptions. He needs one more victory to tie John Elway for most as a quarterback and needs seven touchdown passes to pass Dan Marino&apos;s record of 420.